Springtime sunrise is captured perfectly in these shimmering Simon Carter mother of pearl cufflinks. Featuring a sleek, polished stainless steel edge, these contemporary cufflinks add the perfect finishing touch to your look. 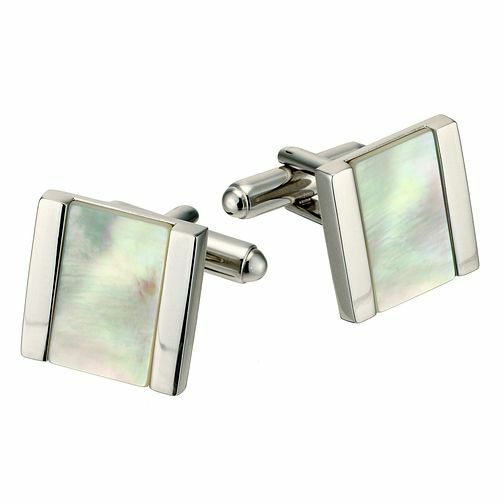 Simon Carter mother of pearl cufflinks is rated 4.0 out of 5 by 1. Rated 4 out of 5 by Becky347 from These cufflinks made the perfect gift I was not at all disappointed with these cufflinks. The quality was excellent and the design smart. Perfect value for the price. I would recommend.